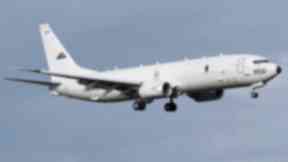 Nine P-8A Poseidon aircraft will be based in Moray from next year. A topping out ceremony for a multi-million pounds facility to house Britain's new generation of submarine hunter aircraft has been carried out at RAF Lossiemouth in Moray. In total, £3bn is being invested in the P-8A Poseidon fleet. The first of the nine aircraft will arrive in Moray next year, with service personnel ready to fly them on the first day due to a training programme that's been ongoing for the past five years which has seen personnel embedded with the US Navy. An additional 470 personnel will be based at the station to operate the planes. The new fleet of aircraft mean the UK will have its own maritime patrol for the first time in a decade, since a new generation of Nimrod was scrapped in 2010 following a UK Government Defence Review. Air Commodore Ian Gale, who is in charge of the P-8 project, said: "It has always been important to protect our shores. We can all see in the news what's happening on our shores, airspace and on our soil and we need to defend ourselves and keep ourselves safe. "We are going to protect our shores by looking for ships or submarines when they find their way into our areas of interest." The P-8 model is already used by the US, Indian Navy and Royal Australian Air Force. Its weapons system includes torpedoes for engaging sub-surface targets. US investment at RAF Lossiemouth is set to total £80m as the superpower plans to fly its own submarine hunter aircraft from the Moray base. The money includes a contribution to runway refurbishment, hangar space and accommodation. The MoD says the move supports UK partnership with its "closest ally" and helps both countries be more efficient. MoD officials said the UK aircraft will form part of the new Defence Arctic Strategy, announced in September by defence secretary Gavin Williamson. The strategy will focus on protecting the High North and Arctic region, with Russia operating more submarines under the area's melting ice. Around 800 Royal Marines will conduct cold weather training in Norway next year, with four Tornado aircraft patrolling Icelandic skies for the first time.